No matter what the weather – come winter or summer – rain or shine – seeds will grow!!! I still get excited when I see my seeds sprouting!! It has taken two weeks for them to go from seed to sprouts! The amazingness of nature!! So every two weeks I should be sowing seeds! Wow, I would have a harvest garden for all to envy! I still have to get to that perfect balance of harvesting food from my garden to sustain us on a daily basis and some for the family and lots for the chickens and compost heaps. I know that with all the knowledge I have gathered since gardening and blogging, I can have this perfectly harmonious vegetable garden. But it still takes enormous effort, energy and time to get the balance right! I am just pleased that I can have this piece of paradise that I call my garden (and home) and that I can share it and what I grow in it will those I care about! I have grown up, along with my seeds, and through my failures and my achievements I am still here! I still make time to go and listen to my plants and play with the chickens and to enjoy heaven on earth – come rain or shine! 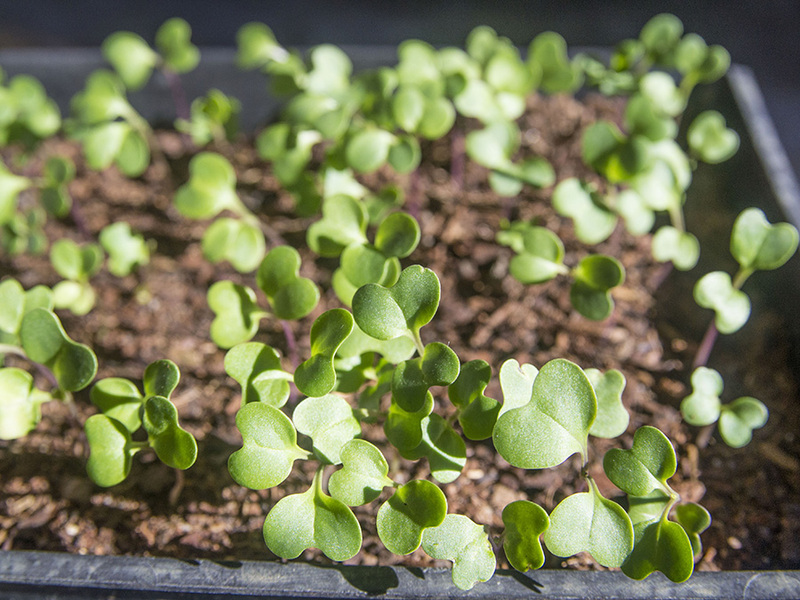 It is so interesting to see the seedlings of Kale – Chinese Cabbage – Sweet Rocket all look alike. I was not aware that Sweet Rocket was of the same family!! Kale is a nutritional powerhouse and is beneficial to your health in many ways. One cup of kale has zero fat and only 36 calories and is high in vitamins and antioxidants. You can eat this green raw or cooked. Kale’s Vitamin A content helps keep the eyes from optical disorders that come with age. It also helps store vitamins in the retina. The calcium and vitamin K and D keep your bones strong. 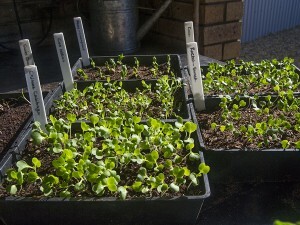 In my seedling trays are: Kale, Chinese Cabbage, Sweet Rocket, Swiss Chard, Peas and Cos Lettuce. Arugula, also known as Sweet Rocket or Garden Rocket, is a nutritious green-leafy vegetable of Mediterranean origin. It belongs within the Brassicaceae family similar as mustard greens, cauliflower, kale…,etc., and has the scientific name: Eruca sativa. Fresh rocket is a very good source of folates. Like kale, salad rocket is an excellent source of vitamin A. Carotenes convert into vitamin A in the body. Studies found that vitamin A and flavonoid compounds in green leafy vegetables help protect from skin, lung and oral cavity cancers. Fresh rocket leaves contain good levels of vitamin C, a powerful, natural anti-oxidant. Foods rich in this vitamin help the body develop resistance against infectious agents (boosts immunity) and scavenge harmful, pro-inflammatory free radicals from the body. Salad rocket is one of the excellent vegetable sources for vitamin-K, which has potential role bone health by promoting osteotrophic (bone formation and strengthening) activity. Adequate vitamin-K levels in the diet help limiting neuronal damage in the brain; thus, has established role in the treatment of patients suffering from Alzheimer’s disease. WOW!! I am growing a powerhouse of goodness!! Barbie it looks great and in time for GBHD I see. I adore Arugula and try to plant loads of it. Wonderful you can get seeds to grow year round outdoors. Hi Donna – I have tried the Sweet Rocket and the Wild Rocket – I like both. The sweet rocket has white flowers and larger leaves that are not as sharp. I do prefer them in my salads. The wild rocket grows wild!! I have never grown or eaten kale, but I think I must try now! Is it much like chard? I discovered chard only a couple years ago, and I love it. It also has wonderful nutritional benefits. No idea!! This is my first time! It is from the same family as broccoli and cabbage, so my guess is it will be like cabbage. Can’t wait to find out! The information on kale was superb and very timely. I am looking for ideas that I can use to make my diet healthier so this was great. Hi Charlie – hows the diet? I am in the middle of winter and just want to eat! Guess if I get my veggie patch looking edible, then it will motivate me! I need to plant some kale! My kids and husband don’t eat it, but I should do that just for myself. Thank you Barbara! Hi Tatyana – welcome to the Gardening Blog!! 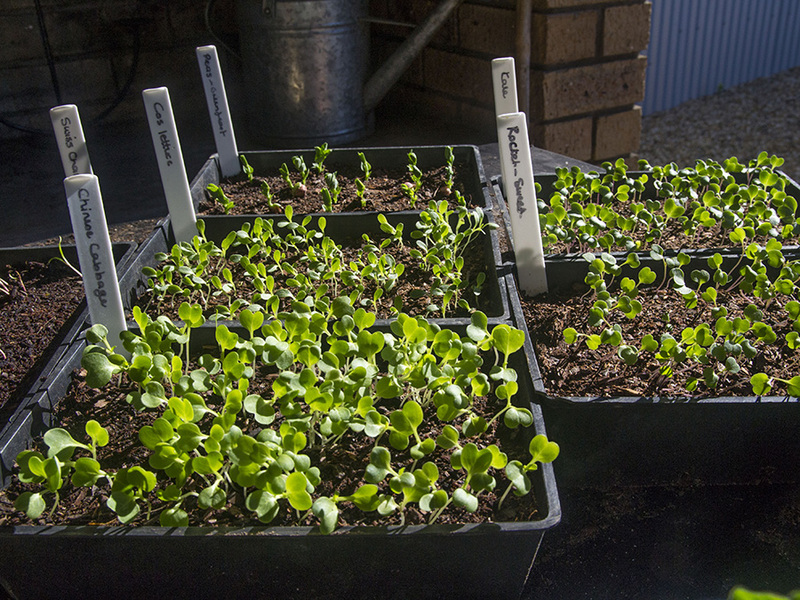 I have been watching a fellow blogger – Alan from Its Not Work Its Gardening http://www.itsnotworkitsgardening.com/search/label/vegetables – and got the idea to grow kale from him, so lets see what we can make from it! All the goodness must be eaten! Great photos and blog. I’ve bookmarked so will check back. Congratulations on the kale seed find! I’ve said it before, but if I could only grow one food plant in my garden, it would be kale. Thanks to you!! It looks like we have a few fans!! I can’t wait. How do you eat/cook them? Isn’t it called the Brassica’s … this family … ? Yes – this is the Brassica Family! 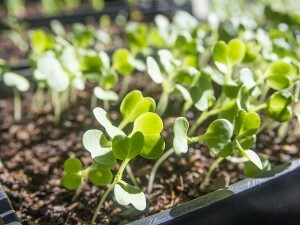 Also, how do you prepare the seedling trays? 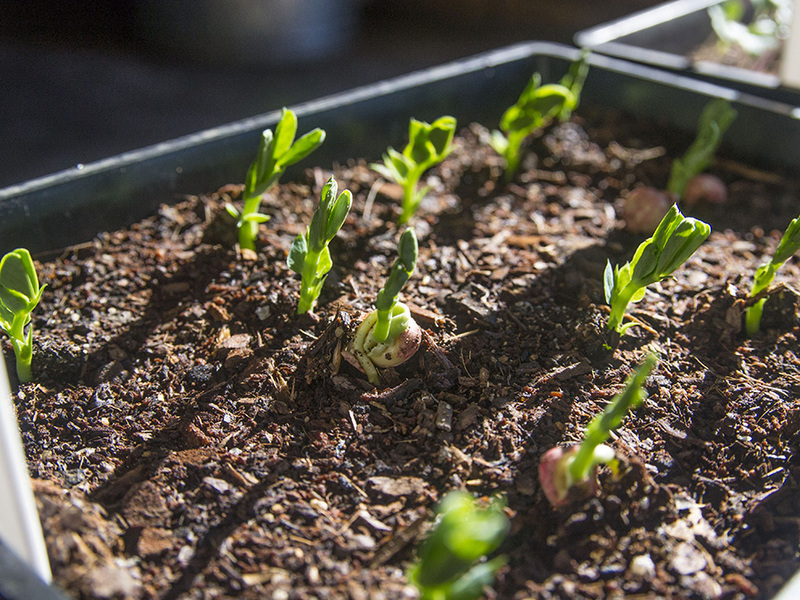 Do you use special seedling soil that you buy from the plant nursery, or can you use ordinary soil mixed with compost? 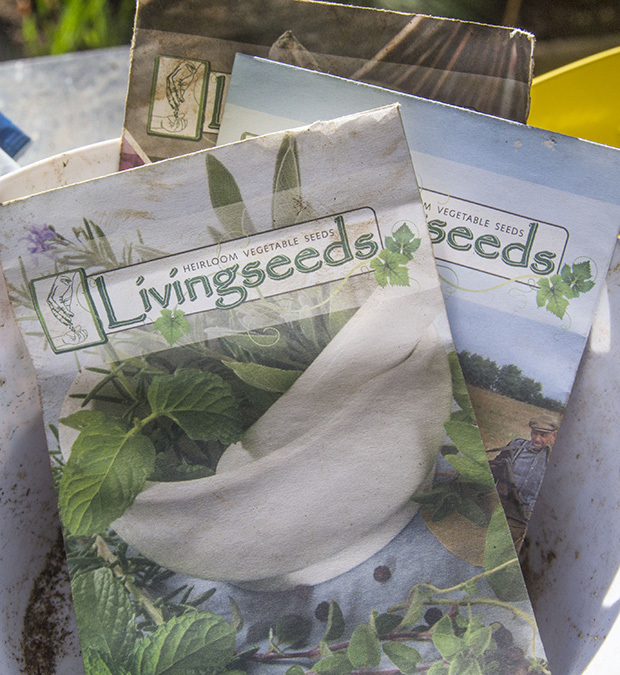 And where do you leave your seedling trays? This is the burning question for me cos I have a tiny garden with either lots of shade or one area that is blazing hot. Also, I have a very curious dog, so I have to keep the trays away from him otherwise he likes to run around with them (soil flies everywhere!) and tear them up! So my only real option is a full-shade area under a pergola with thick bougainvillea. It is light but no direct sun at all. Thanks for your comment. 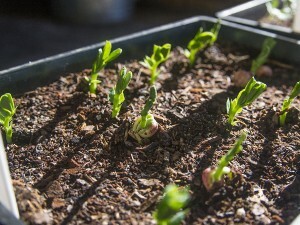 I buy them online at http://www.livingseeds.co.za. The seedling mix I but from my nursery I mix with peat, a few handfuls of bone meal and them my amazing worm compost. This makes an amazing soil for my seedlings. The problem is that they need sun!! Maybe you can pot them and keep them on a shelf in the sun! You are not going to get strong seedings in the shade! What about a hanging garden? ?